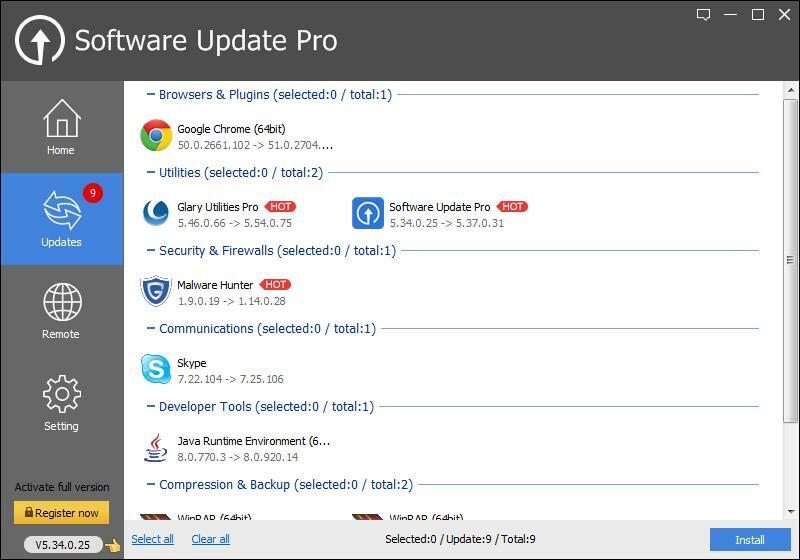 A software client designed to inform you of available software updates! Software Update Pro 5.43 was available as a giveaway on November 6, 2017! Small, easy-to-use and highly functional with intuitive interface. Supported by a growing software library. How would you improve Software Update Pro 5.43? I intend to uninstall this program, it's too intrusive. It starts at computer startup and I cannot find a way to stop that. If I right-click the icon in the taskbar to shut it down, it opens a page at Glary's website where I am supposed to purchase it. Can only be shut down via Task Manager. This is unacceptable, it might as well be malware. I intend to uninstall this program, it's too intrusive. It starts at computer startup and I cannot find a way to stop that. If I right-click the icon in the taskbar to shut it down, it opens a page at Glary's website where I am supposed to purchase it. Can only be shut down via Task Manager. This is unacceptable, it might as well be malware. patchmypc.net is a free alternative. There are enough free alternatives: Most anti malware manufacturers offer this feature in their products even the free version of Avast has it included. Kaspersky has a free version, even if you don't have their anti malware product. And File Hippo offers this free for years now. 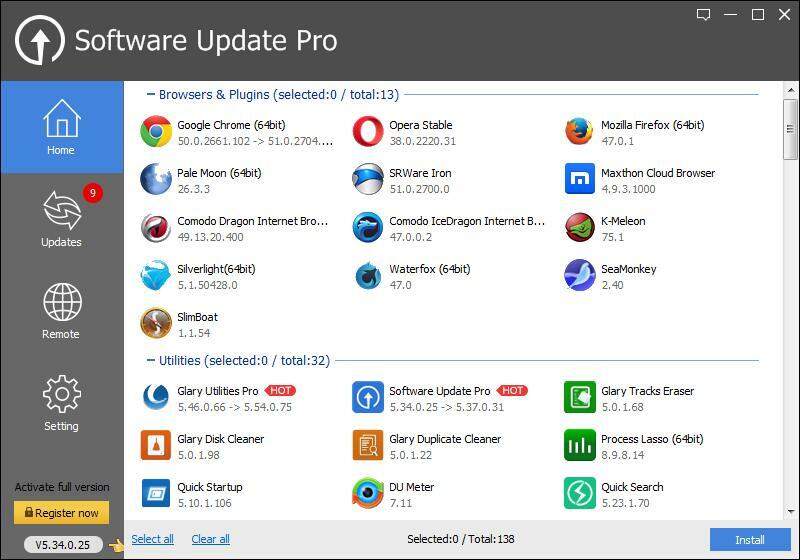 How does this differ from the updater included in the freeware version of Glary Utilities. If not at all, then they are 'giving away' a facility they have been offering free for years! Reading the comments, it is yet another long trial period, what is the point? What happens after a year, it just stops working? Or are they saying that you can continue to use it, but you won't get any updates, which I guess means it become useless anyway? Strange, and not sure what the point of this is, when ever you install a program, you can usually choose how the program updates, either automatically, or you can usually open the "help" menu and check for updates. This seems like a lazy mans program, plus it isn't free as GAOTD was created for. Sorry glary, you just got put on my list of vendors I won't be supporting. Don't give something away, but not give it away. Free means I own it, for as long as I like, I am not leasing the program, but that is exactly what you are doing, offering a lease, no thanks. Reading the comments, it is yet another long trial period, what is the point? What happens after a year, it just stops working? Or are they saying that you can continue to use it, but you won't get any updates, which I guess means it become useless anyway? Strange, and not sure what the point of this is, when ever you install a program, you can usually choose how the program updates, either automatically, or you can usually open the "help" menu and check for updates. This seems like a lazy mans program, plus it isn't free as GAOTD was created for. Sorry glary, you just got put on my list of vendors I won't be supporting. Don't give something away, but not give it away. Free means I own it, for as long as I like, I am not leasing the program, but that is exactly what you are doing, offering a lease, no thanks. (9) Receive 1 Year license; run software for first time; activate license. Verdict: other developers partnering with GOTD seem to manage OK without mandatory highways inspections. Glarysoft should do likewise. (6) In total, Glary Software Pro advises that just 12 of its 132 scan results are suitable for updating. Verdict: if this software is 'pro' anything at all, then it is pro-Glarysoft, a means of flagging up the developer's other products. Rather than identifying actual software on my computer which may or may not merit updating, it instead catalogs the status of 132 items of which 90 are as relevant to me as would be the news of a bigger, better meat pie to a vegetarian. Thanks, GOTD, but no thanks. Uninstalled. <b>Installation:</b> elongated: (1) Download link promptly emailed by GOTD; (2) Linked web page promptly opened and 12Mb zipped download completed; (3) Executable scanned by VirusTotal. Result: 2 / 67 (two warnings out of 67 engines: false positives.) (4) Read Me text is unambiguously clear: install software; get license; <b>then and only then</b> run software so as to input license; (5) License Agreement touts developer's 'Malware Hunter'. <b>Leave check box unticked;</b> (6) Installation completes, with check box 'Run Software Update Pro' already ticked. <b>Untick</b>; (7) Installation triggers Glarysoft web page <i>'Activate Glarysoft Update Pro now! '</i> for $9.98. This page confusingly overlays GOTD's own <i>'Successfully activated'</i> message and the link to a quite different page for the software license; (8) New page <i>"Software Update Pro 1 Year license giveaway" </i>seeks customer's email address and assurance that he / she is not a robot. By way of proof in my case, examination was required of several dozen largely unfocused Captcha shots to identify eight or nine, er, highways. Hopefully, this won't prove I'm Robo-traffic-Cop and I'll have to start over with store fronts; (9) Receive 1 Year license; run software for first time; activate license. Verdict: other developers partnering with GOTD seem to manage OK without mandatory highways inspections. Glarysoft should do likewise. <b>Performance:</b> (1) Revo Pro on my computer reports <b>299</b> installations (though obviously, that does not mean 299 separate programs); (2) Glarysoft Update Pro scans my computer and <b>appears to report</i> <b>132</b> installations; (3) Of these 132, <b>at least 90 are not on my computer anyway;</b> (4) Noticeable in the scan results is information about updates to Glarysoft products that I don't have, including (surprise, surprise) Glarysoft Malware Hunter -- described as <b>HOT</b> -- and Glarysoft Tracks Eraser, Glary Disk Cleaner, Glary Utilities, Glary Duplicate Cleaner, Glary Undelete and the equally <b>HOT</b> Glary Utilities Pro; (5) The scan also points out that Glary Software Update Pro needs updating from the version I've only just gone to the bother of installing; (6) In total, Glary Software Pro advises that just <b>12</b> of its 132 scan results are suitable for updating. <b>Verdict: </b> if this software is 'pro' anything at all, then it is pro-Glarysoft, a means of flagging up the developer's other products. Rather than identifying actual software on my computer which may or may not merit updating, it instead catalogs the status of 132 items of which 90 are as relevant to me as would be the news of a bigger, better meat pie to a vegetarian. Thanks, GOTD, but no thanks. Uninstalled. MikeR, Software Update Pro, lets you install a variety of software that is not on your computer. The 132 programs it lists, is not a count of the programs installed on your computer, it is the number of programs that Software Update Pro can install. You can click on any programs you want to install, and then click on the Install button on the bottom right, to download and install all of your selections with just one click. If you click on the Updates icon, it will only show programs that are installed on your computer, which it can update. You will no doubt have the latest version of some of these installed already, and for these it will say "up to date" after the version number. MikeR, Software Update Pro, lets you install a variety of software that is not on your computer. 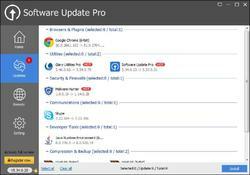 The 132 programs it lists, is not a count of the programs installed on your computer, it is the number of programs that Software Update Pro can install. You can click on any programs you want to install, and then click on the Install button on the bottom right, to download and install all of your selections with just one click. If you click on the Updates icon, it will only show programs that are installed on your computer, which it can update. You will no doubt have the latest version of some of these installed already, and for these it will say "up to date" after the version number. What will happen to GAOTD programs for which I do not have licence keys? Will this update make them stop working? Where do you enter the license 3 for the free pro version? I've got the activation they sent me. Joel, when you open the program click on the blue "Manage Licence" button in the bottom left. Then press "Refresh", paste your code in the "License code" box and press activate now. When you do that you should see the expiration date change and it should say you have 366 days left. Hi, please pay Attention when trying to update majority of GOTD Software!!.. Most of them DO NOT offer updates 'per se', some state they'll provide it for a limited period of time (worth checking Installation dates) So be smart and tread carefully in your own interest, or you might lose important Licenses!.. Hi, please pay Attention when trying to update majority of GOTD Software!!.. Most of them DO NOT offer updates 'per se', some state they'll provide it for a limited period of time (worth checking Installation dates) So be smart and tread carefully in your own interest, or you might lose important Licenses!.. In this Win10 is also installed: 7-zip, Internet Explorer, Shadow Defender, Deep Burner, BurnAware Premium, DYMO Label v.8, Oracle VM VirtualBox. It's definitely worth a try. I have enjoyed Glary Utilities in the past. does anyone know what "Quality Software Recommendation" and "Quality Software Download" are? From their website https://www.glarysoft.com/software-update/ does anyone know what "Quality Software Recommendation" and "Quality Software Download" are? This software does not give you an option for where you want the software installed, that I could find anyway. I keep a drive just for the OS and install software on another drive, some people have quite small SSDs and similarly want to keep them just for the OS, so this software might not suit setups like that. Nick H, It looks like it, that the update will be installed in the place where the old version is seated. Ootje, Both Calibre and Wireshark were installed into new folders on my C drive when previous versions are already installed on another drive. VLC and CCleaner got installed where the older versions were. It was a hit and miss experience for me. Nick H, the programs will be installed to Program Files or Program Files (x86) on your system drive. There is no way to change this, because it silently installs the updates, so are not able to do customize the installs. Just use PATCHMYPC + SUMo....both FREE and PORTABLE apps....and you are done! Mario, unlike SUMo, Software Update Pro can actually download and silently install (so no user intervention is required when installing the updates) any software updates it finds. In comparison, SUMo just takes you to software's website, and you will have to manually download and install the new versions of thesoftware. Mario, unlike SUMo, Software Update Pro can actually download and silently install (so no user intervention is required when installing the updates) any software updates it finds. In comparison, SUMo just takes you to software's website, and you will have to manually download and install the new versions of thesoftware. Mario, None of PatchMy PC, Sumo or Software Updater finds all of my installed software, between them they find most of it. Its almost an impossible task to find all of the software that people may have installed. Nick H, "impossible task to find all of the software that people may have installed." It's not true. This only depends on the developer's ability to search not only the registry and standard installation directories, but also the directories specified by the user. In SUMo, you can add a program that updates your interests and which SUMo did not find during the search. opikPL, I wrote "...almost an impossible task...". Your copy and pasting makes a big difference to what I actually said by choosing to omit the word 'almost'. It doesn't actually install, all you get after clicking on the setup icon is a successfully activated message & then get taken to a GOTD webpage. Certainly no programme there. MOV, Thanx a lot for info. Then I'll stick to PatchMyPC, which find the updates....and updates the programs as well. MOV, actually, once you enter the license code to activate the Pro version, it can automatically download and install any updates it finds, without any user interaction needed. Does this mean that it is not free but has a time-limited time frame ? Under the Price on the right of this page is "The program is available for $19.95, but it will be free for our visitors as a time-limited offer." Does this mean that it is not free but has a time-limited time frame ? wombat, it is free for 24 hours but it is a lifetime with NO updates. Chris, no it's not. It's a 1 year license. This will include updates to future versions released within the next year. The program has a one year time limit as stated in the email you receive with the key.